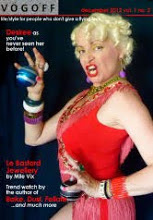 including Jacqui Gallant, who always wears something fabulous to her exhibit openings. 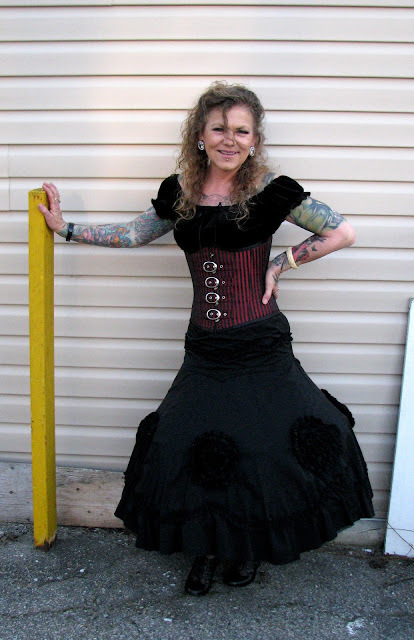 She found the skirt, and the hoop beneath it at Goodwill. This young woman (my apologies for neglecting to get her name) sang during the opening. 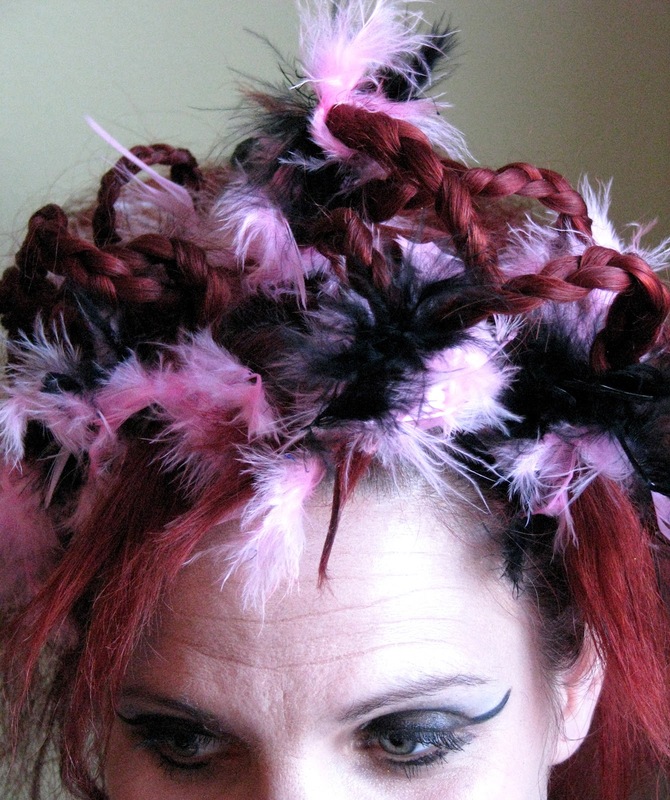 Her voice was quite lovely, but I was more intrigued by her hair, which was done up in braids woven with feathers (see closeup below). 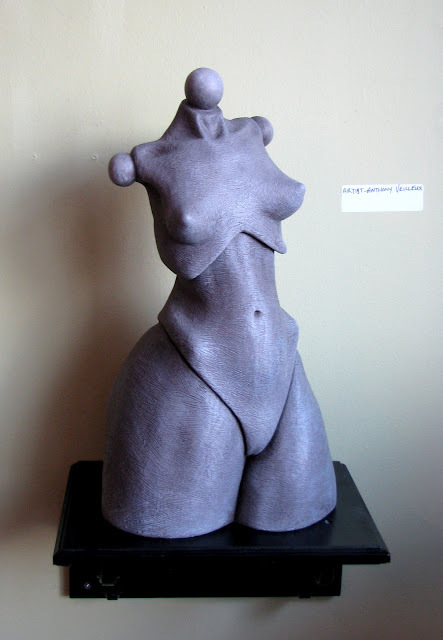 One of my favourite local artists, Anthony Veilleux, has a number of sculptures in the show, including the woman's torso in the photo above. One of the few dolls in the show was "Corpse Bride", created by Kamla Mlynarczyk that was a much more realistic and therefore creepy-looking version than Tim Burton's. 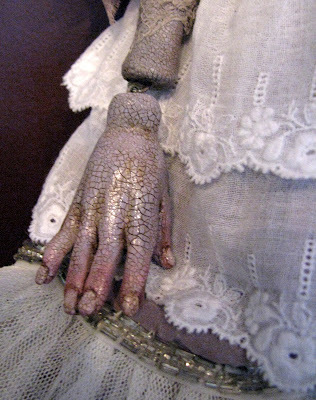 The detail that Mlynarczyk put into the doll was quite amazing, as seen in the photos above and below. Dollirium is carrying bags, comics and t-shirts that feature drawings by London artist Sarah Legault. 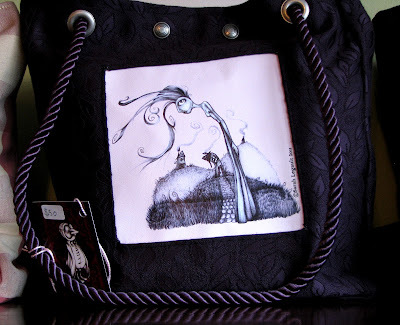 I love the finely detailed dark "cartoons" that Sarah creates and I think they look amazing on the black handmade bags. Check out Sarah's website for more details. 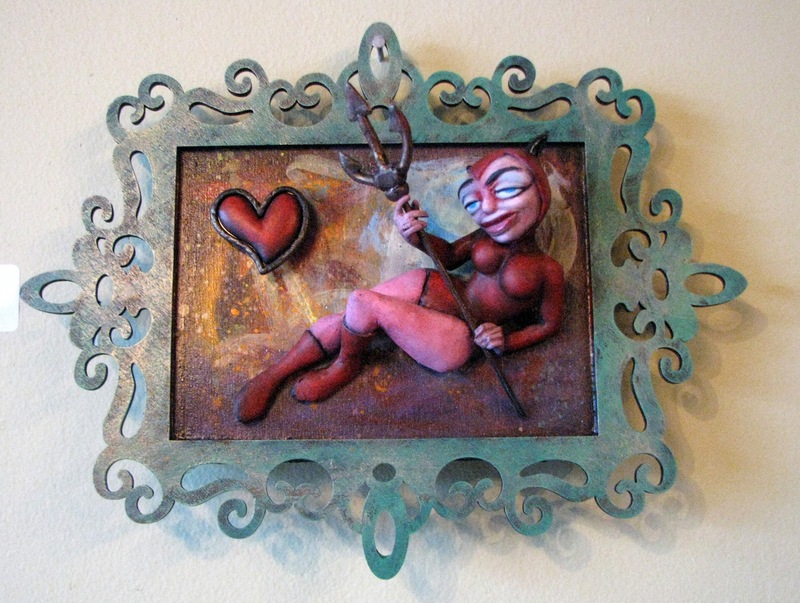 The exhibit, "In the Garden of Hedon" continues until April 22nd. Dollirium is located at 1 Cliftonvale Ave., behind True Love Tattoo, and is open Tuesday - Saturday. 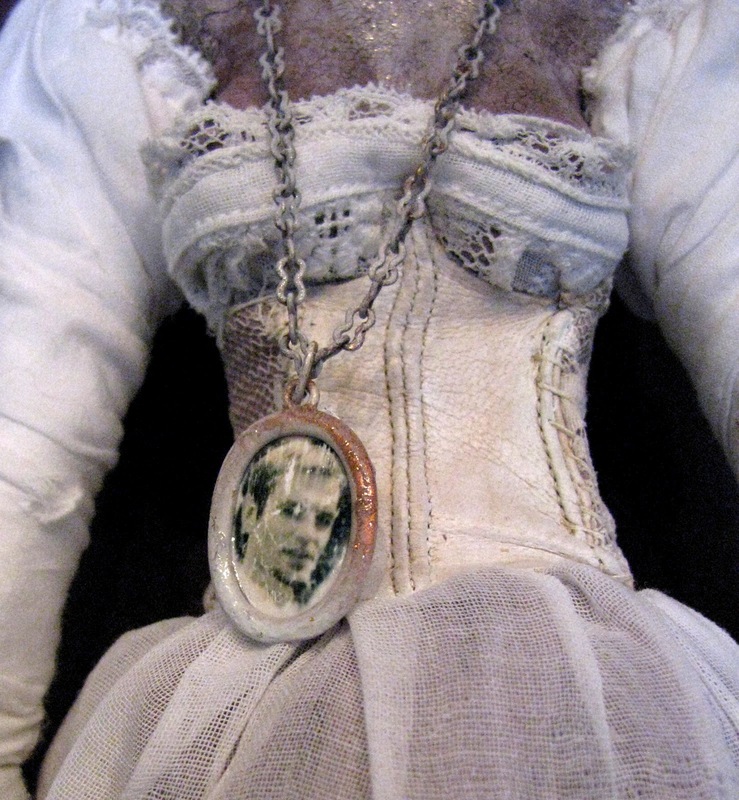 Wow, corsets and creepy dolls and feathered hair - a feast for the senses. 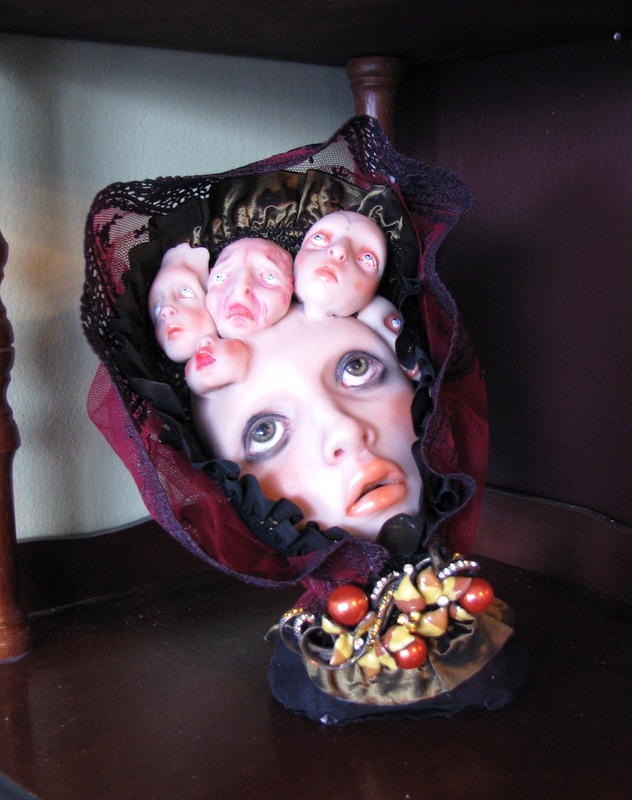 The Seven Deadly Sins reminds me of a bridal bouquet, its pyramid shape and its size, and little heads like florets. That would be a spooky thing to carry down the aisle! 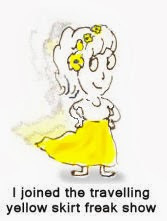 I have just found your blog through Ariane, and I am here to stay, yeahhhhhhhhhhhhh. 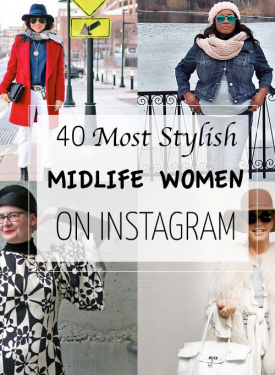 Followin and adding you to my blogroll.